You've found the “U.S. Navajo-Churro Sheep Breeders” page here at Hobby Farm Wisdom! If this is the first time you have visited our site: Welcome! Navajo-Churro is a breed of domestic sheep that is descended from the ancient Iberian breed, the Churra. The Churra was the first breed of domestic sheep brought to the Americas by the Spanish. This breed can be found in a variety of colors, including white, silver, blue, brown, red, black, and spotted. The large range of colors is considered a great benefit by breeders and wool crafters. Navajo-Churro sheep have a thick double-coated fleece that can weigh up to six pounds. Their double layers have allowed this breed to adapt to extreme climates, both heat and cold. Since the fleece is low in grease, it is easier to process than others. Their wool is considered carpet wool, primarily used for rug weaving. 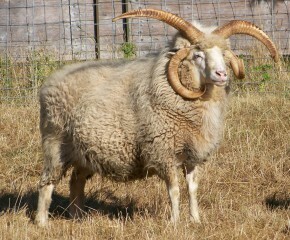 One unique quality is that some mature ram have 4 fully developed horns, something few other breeds have.